Smart Gun technology has been all the range at recent industry trade shows and now Obama wants to invest tax dollars into researching viable solutions. 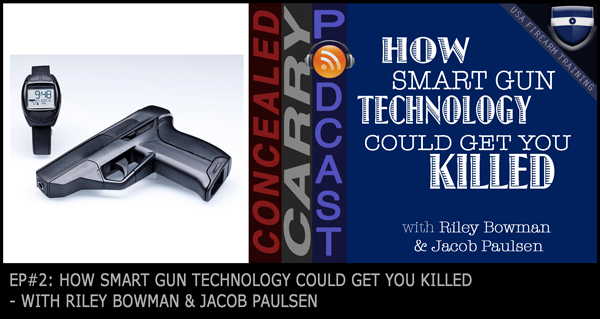 In today's episode we explore the good and the bad about existing “smart guns” and the products being developed. Today’s episode is sponsored by the Traveler’s Guide to the Firearm Laws of the Fifty States – every time you cross state lines with your gun you run the risk of breaking the law? Since each state sets it’s own laws about where you can and can’t take a gun and how you have to transport it within their state boundries, gun owners risk jail time and fines when they neglect to do the research. The Travelers Guide is the industry’s top resource, endorsed by the NRA, and used by the NFL and NBA, this physical book can stay in each of your cars and give you a single page run down of the gun laws of any of the fifty states. Now updated for 2016. Click here for details. Thanks so much for joining us this week. Have some feedback you’d like to share? Leave a note in the comment section below. If you enjoyed the podcast the biggest compliment you could give us would be to subscribe to future episodes via a podcast app on your phone or via iTunes. My opinion is leave guns alone. They need to be used as intended purely for self defense. At a moment’s notice. Let’s make smart automobiles so thousands of people aren’t killed every year. Generally speaking you may not transport firearms outside of the United States under any circumstances. Long guns may be allowed in certain countries under certain circumstances (like hunting) but paperwork is generally involved. Is this the general mentality that’s promoted when others riot or try to justify the actions of a youth who was attempting to grab an officers firearm. I and my children know that if you’re trying to grab someone’s gun chances are you will be shot..